This is ReachMD. Welcome to this special series,Rheumatoid Arthritis: Addressing Unmet Needs, sponsored by Lilly. 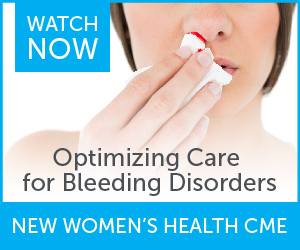 On this episode, titled “Understanding the JAK-STAT Pathway in RA”, we will hear from Dr. Robin K. Dore, Clinical Professor of Medicine at David Geffen School of Medicine, UCLA. There are 4 JAKs: Jak1, 2,3 and Tyk2, and there are 7 STATS. Jak1 and Jak2 mediate the signaling of cytokine targets in our diseases, IL-6 and IL-23. Jak3 mediates T and NK cell signaling, maturation and immune function. So, there is a potential for less immune suppression with Jak3. The binding of the cytokine to the cell surface can result in 2 different situations. Two separate receptor poly type change to dimerize or reorients the receptor change in a preformed dimer or trimer. Associated Jaks are brought together so they can cross phosphorylate each other on tyrosine starting the signaling process. STATS dock on the phosphorylated tyrosine, then Jaks phosphorylate the STATS. STATS dissociate from the tyrosine receptor and dimerize. The dimerized STATS then translocate to the nucleus where gene transcription of these proinflammatory cytokines occur. Increased Jak2 expression is seen also in other diseases than rheumatoid arthritis including scleroderma, diabetes and whole blood of lupus patients. Other tyrosine kinases can phosphorylate STATS independent of Jaks. 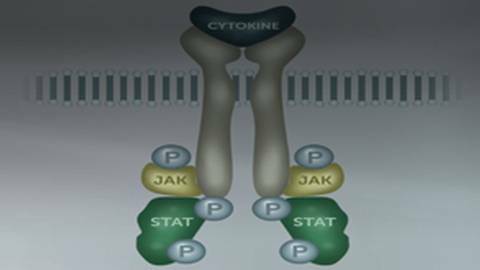 For those cytokine receptors that lack intrinsic kinases signaling can be mediated by Jaks. Jaks bind with homo or heterodimers and become auto phosphorylated by ATP becoming ADP, and then, phosphorylate the tyrosine receptors. Phosphorylation of the tyrosine receptors allows for docking of the STATS which upon phosphorylation of the STATS dimerize and translocate to the nucleus. JAK-STAT signaling allows signaling of over 40 different cytokines and receptors and plays a large role in rheumatic diseases. Dr. Robin Dore explains the inflammatory mechanisms of the JAK-STAT pathway in contributing to rheumatoid arthritis disease development. Dr. Robin Dore, Clinical Professor of Medicine at UCLA's David Geffen School of Medicine in Los Angeles, CA diagrams the JAK-STAT pathway as it relates to inflammatoty change and RA disease progression.